UNDER MOOR COTTAGE Blaenau Ffestiniog, self catering cottages with instant confirmed online booking. We have Self Catering throughout Gwynedd , Wales . Accommodation near all the attractions, places to see and things to do.......You are able to make an instant secure confirmed online booking. We also offer Gwynedd AND Wales travel and tourist information.. 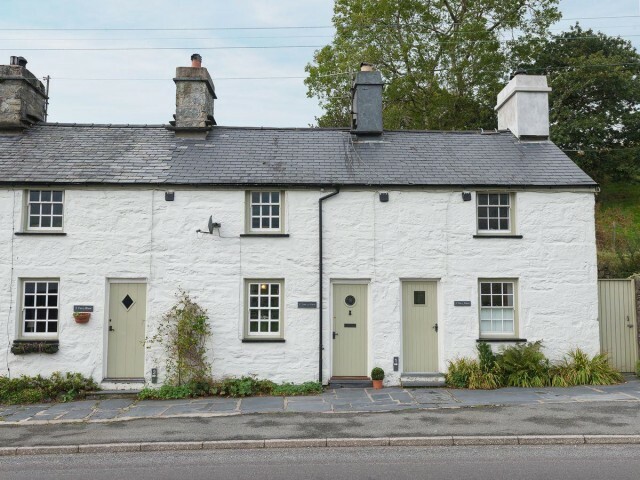 Under Moor Cottage is located 1 mile away from Blaenau Festiniog, and is also ideal for visiting Betws-y-Coed and the Conwy Valley. . This delightful mid-terraced holiday cottage, situated on the outskirts of town, dates from the 18th century and features a warming woodburner, a small terraced garden with a barbecue and great views of the surrounding mountains. It also benefits from parking for one medium car. The former slate quarrying town of Blaenau Ffestiniog is rich in heritage, with the famous Ffestiniog Steam Railway providing a spectacular journey down to the coast at Porthmadog. There are several fantastic attractions, including the Stiniog downhill bike trails, Bounce Below, where you can trampoline underground in a slate cavern, and Zip World Titan, where you can go down ziplines. Black Rock Sands and the Italianate village of Portmeirion are within easy reach; whilst in the other direction are Betws-y-Coed and the Conwy Valley. Beach 9 miles. Shop and restaurant 1 mile, pub &frac12; mile. . Step to entrance. Ground floor: Living room/kitchen with breakfast area, beams and tiled floor. First floor: 2 bedrooms: 1 double, 1 bunk. Shower room with toilet. . Woodburner in living room (initial fuel included). Electric heaters, electricity, bed linen and towels included. Freeview TV. DVD. Electric cooker. Microwave. Washing machine. Fridge/freezer. Wi-Fi. Terraced garden with patio, sitting-out area and furniture. Barbecue. Parking (1 car). No smoking. NB: 10 steps in terraced garden. This delightful mid-terraced holiday cottage, situated on the outskirts of town, dates from the 18th century and features a warming woodburner, a small terraced garden with a barbecue and great views of the surrounding mountains. It also benefits from parking for one medium car. The former slate quarrying town of Blaenau Ffestiniog is rich in heritage, with the famous Ffestiniog Steam Railway providing a spectacular journey down to the coast at Porthmadog. There are several fantastic attractions, including the Stiniog downhill bike trails, Bounce Below, where you can trampoline underground in a slate cavern, and Zip World Titan, where you can go down ziplines. Black Rock Sands and the Italianate village of Portmeirion are within easy reach; whilst in the other direction are Betws-y-Coed and the Conwy Valley. Beach 9 miles. Shop and restaurant 1 mile, pub ½ mile.